Safety is always the number one priority. A welding apron protects the front body and helps to avoid serious injuries like burns and sparks. Most welding aprons are designed to be robust, secure and durable. When working with sparks, chemicals and flames, a resilient apron is key to providing personal protection. These aprons are specially made from leather to offer maximum protection and comfort whilst working. This material is selected to specifically provide support in high temperatures and is ideal for heavy-duty welding. Leather aprons can be used outdoor and are weather-resistant. This advantage allows maximum productivity in damp conditions. To ensure you select the best apron, Engweld has pulled together a list of some of the best welding aprons on the market. Here’s the list of the chosen aprons to suit all price ranges. This extra long 42 in. apron offers unrivalled protection. It has a criss-cross adjustable tie which makes this apron suitable for any body type. The Golden Brown Leather is sewn with a Kevlar thread to add to the longevity and resilience of the apron. It is also made using a heat abrasion resistant selected split cowhide. Size: 107 x 60 cm. 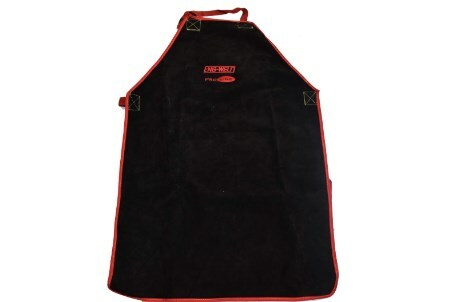 This premium A split cow leather apron has a focus on strength and comfort. The thickness of 1.8 mm improves the durability of the apron, especially around high impact areas, such as the waist. Cotton webbing improves the aprons high strength, making it strong enough to withstand heavy loads. Size: 24 x 36 in. (65 cm x 90 cm). This tough and hard wearing apron offers maximum protection from heat and sparks generated from welding and other industrial applications. The buckle and leather ties make this apron suitable for most body types. The waistband offers full protection, helping the apron stay in place, ensuring safety and defensible. Please see the selection of products on the Engweld website. Engweld has supplied welding equipment and accessories to welding and engineering companies throughout the UK since 1970. They provide the best products to meet the needs of welding professionals in numerous industries.